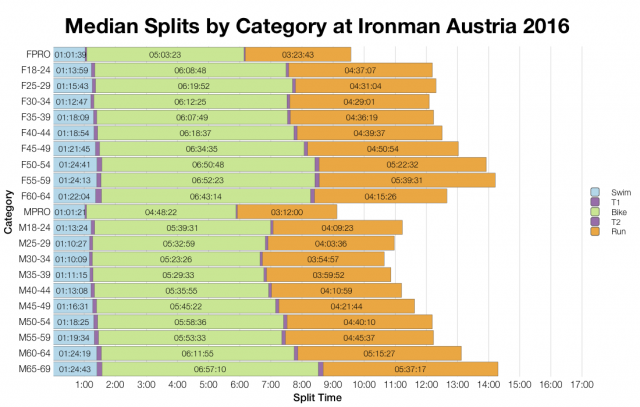 This weekend’s Ironman racing was in Austria, one of the fastest courses on the circuit. It’s a large and competitive event, especially when there are only 40 Kona slots for over 2,500 athletes racing. This year looks to have been a mostly average affair under moderate conditions. Qualification times in Klagenfurt are always fast, this year is no exception to that, but neither is it remarkable. The one consistent pattern in these results is a marginally slower swim distribution from this year’s race. For whatever reason swim times appear to have come out a minute or two slower than the averages from the last 10 years. Bike and run vary less, coming in fractionally faster at their medians. This is by no means a significant change in performance at any stage of the race. Competitor numbers through the event suggest DNF and DNS rates match previous years. If anything it looks like the DNF rate might be down very slightly. Moderate conditions on a fast course tend to ensure a higher rate of finishing. 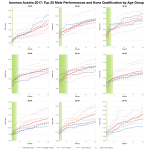 There are small differences in the median splits by age group when compared with the past. Swim trends slightly slower overall, but it’s small. 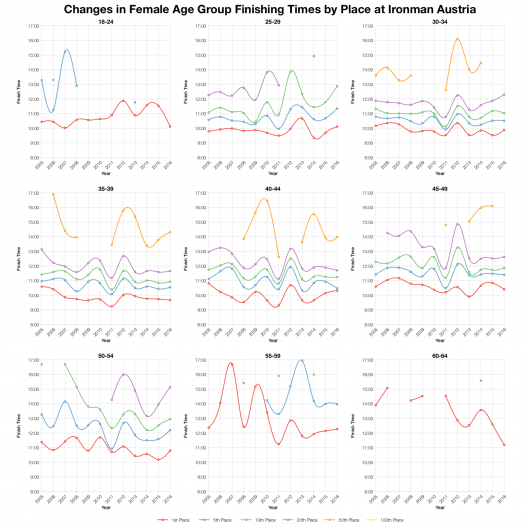 Bike and run trend slightly faster, but again the change is small. 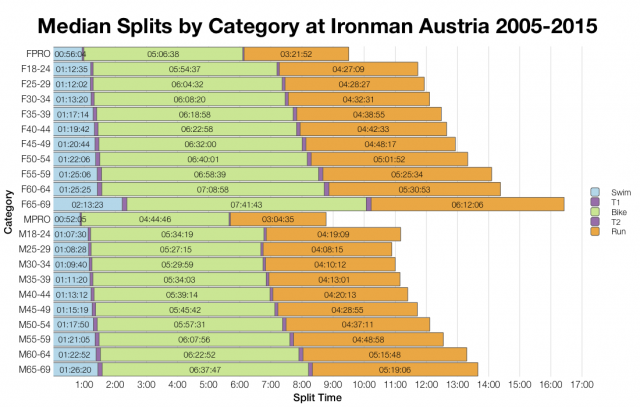 Generally the data doesn’t deviate too much from previous race results. As we’d expect the strongest contingent at the race is local; interestingly it’s the UK that takes the second spot. 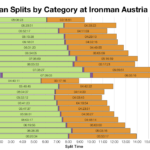 Results at Ironman Austria have been fairly consistent over the last 12 years varying with conditions and course adjustments in that time. This year’s race isn’t the fastest, although it falls towards the faster end of results in Austria. 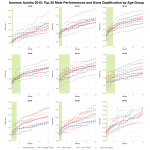 This seems particularly true towards the front of the race and higher Age Group placings. 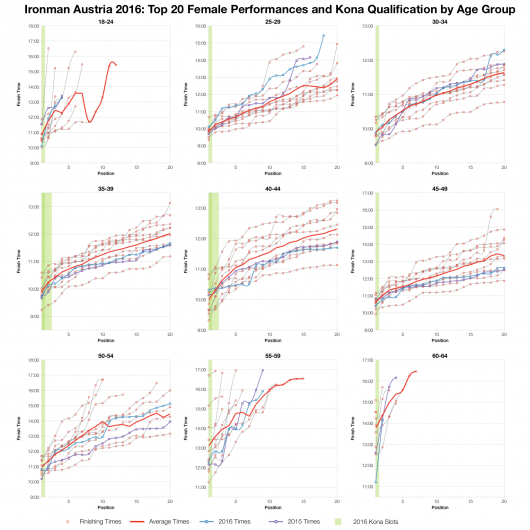 At only 40 Kona slots there’s a relatively thin distribution across the age groups. 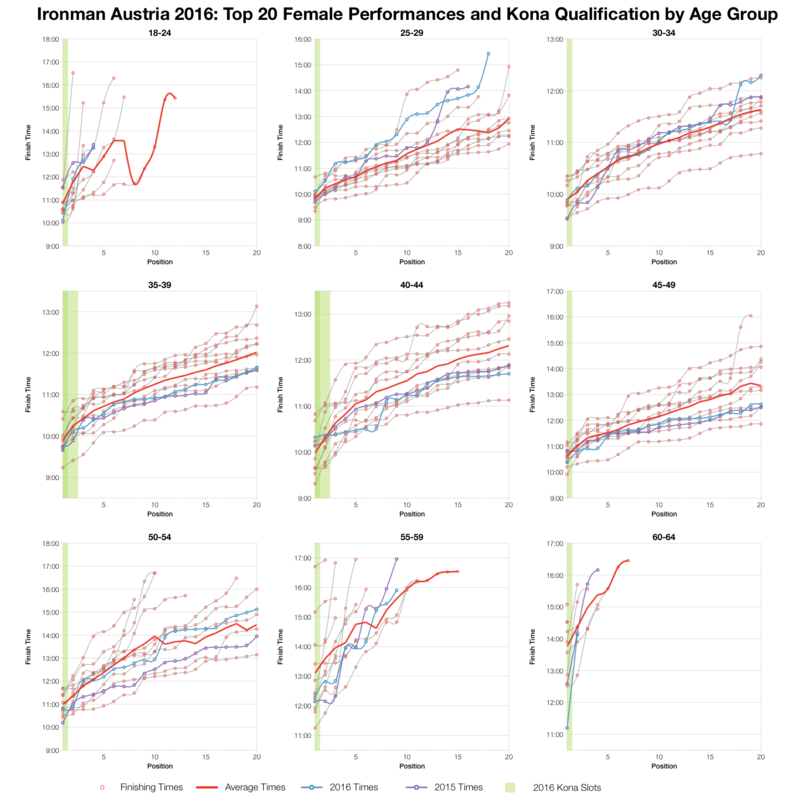 I’ve calculated the numbers from the start list (actual numbers depend on actual starters) and used that to determine the likely automatic qualification times in each age group. You can find more information on this and compare the numbers with other races on my Kona Qualification page. There’s some variation in results for different age groups. 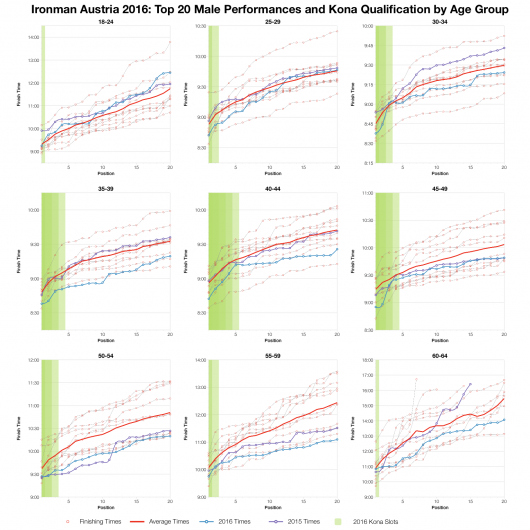 Broadly, younger and female age groups appear to have fallen close to the average for their top twenty placings. 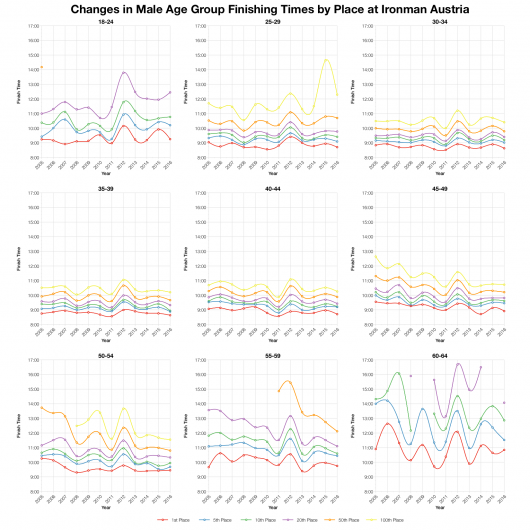 It’s the older male age groups where we see a trend towards faster qualifying times. 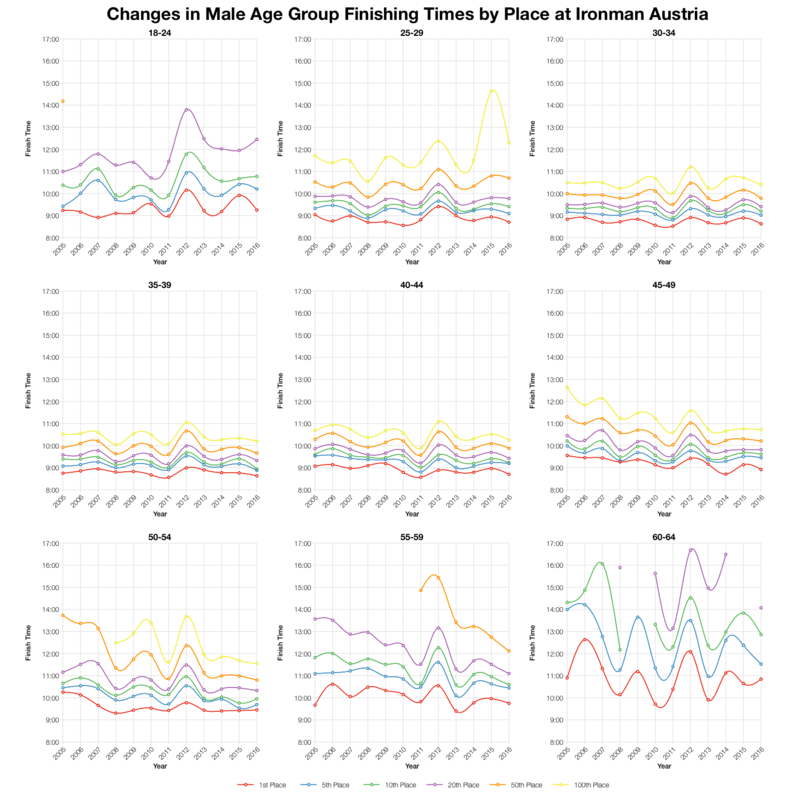 Of particular note, top 10 results in the male 35-39 age group were the fastest seen in 12 years of results. Conditions may have been moderate and overall times typical for the course, but not every age group was average. At the front of the pack there was a highly competitive race for the limited number of Kona slots. You can view a spreadsheet of the full results and splits from Ironman Austria 2016 on my Google Drive.